An Australian Navy ship recently captured Somali pirates who fired on a supertanker near the Horn of Africa before a Navy helicopter blew up their skiffs. 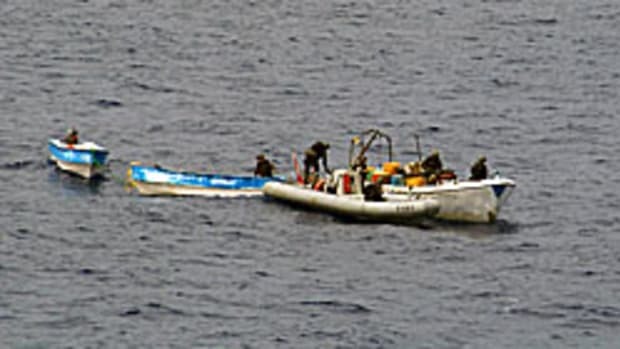 HMAS Melbourne, which destroyed the pirates’ boats, was patrolling as part of a multi-national anti-piracy task force, according to Business Insider Australia. Nine men were arrested, after a Seahawk helicopter traced the skiffs and guided the Royal Australian Navy warship to them, 500 nautical miles off the Somali coast, according to a statement from Combined Maritime Forces. The Combined Maritime Forces are a cooperative effort between 29 countries which patrol international water, guarding against piracy.